Ok so I've decided to pull the trigger and retro-fit some projectors into my 06. For those of you who have done it, did you remove the headlight reflector altogether or did you just modify it so that the projector can be mounted? I really want to eliminate as much chrome/silver as possible from my bike. Do you recommend removing them completely, or should I just mod them to get the projectors in there and spray them with a flat black paint? Input is appreciated! If you bought a retro-fit kit like the FX-R then you remove the reflector. If you have an ebay special type one then I believe they go over the reflector. I have seen someone just paint the reflector black and then you don't notice it behind the reflector. it might be easier to mount them up if you still have the reflector in there though. So id say paint it black and try cutting it to fit first, if you have no luck then remove it. I bought a retro-fit kit. Hopefully it's not too hard to mount. I guess we'll see. Maybe I got in over my head on this one... lol. Well definitely post up pics throughout the install. Well I'm still in the beginning stages. No real progress to post pictures of. All I've done so far is remove the headlight assembly from the front of the bike. Waiting on my buddy before I put them in the over. 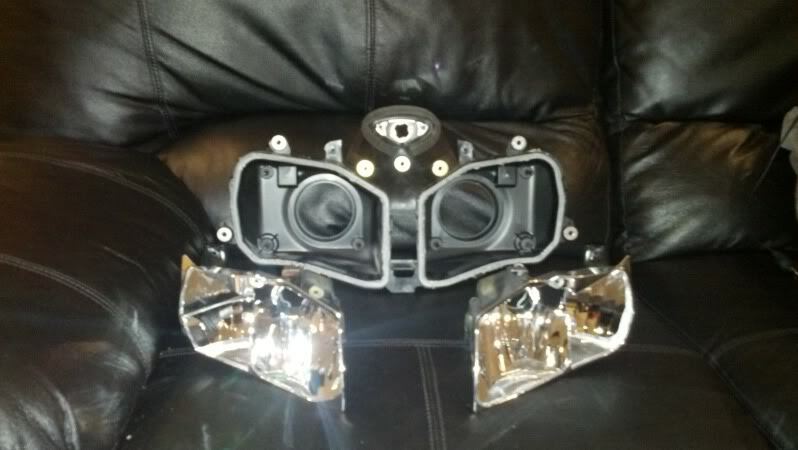 For some reason putting my headlight assembly in the over really scares me. My projectors will show up in the mail on Monday. I'll definitely keep you guys updated though. Ok well I did some research and figured out that the projectors I bought come with adapter plates to mount them into the reflectors. So I guess the reflectors are staying. I did muster up the courage to toss them in the oven this afternoon. 250 degrees for 5 minutes. I was nervous at first, but it worked like a charm. I got the left side off easily, but the glue got cool and I had to put the assembly back in the oven for another few minutes. Projectors are scheduled to be here Monday (tomorrow) so I'm pretty pumped. More progress will come ASAP, and once I get into the more detailed steps I'll begin posting a few pictures. Reflectors out of the housing and ready to be modded to accept the projectors. Projectors came in the mail today. They're bigger than expected, and the reflectors will require extensive modification to accept the projectors. I'm going to try and modify the reflectors enough to accept the projectors. If I'm not satisfied with the outcome I'm going to try and fab up some brackets using the stock adjusters to mount them.